The French city of Thiers has been affectionately referred to as the country's cutlery capital for over six centuries. So, it comes as no surprise then that the world's most beautiful and expertly crafted cutlery would hail from this region. One look at this exquisite Oyster Shucking Set and the workmanship is clear. 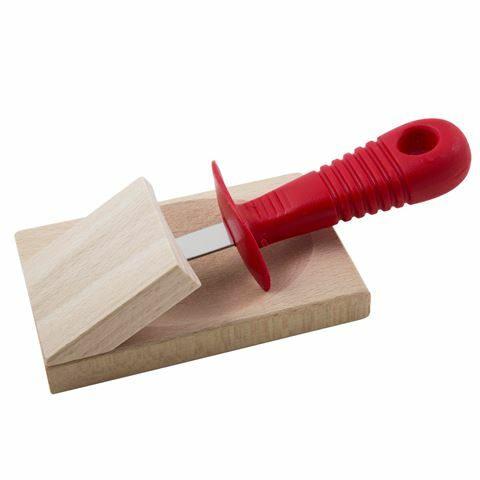 The French-made wooden block and stainless steel knife work together simply and efficiently, allowing you to savour the fruits of the sea and protect your hands in the process. To use, simply place your oyster in the groove and burrow the knife in to the oyster’s “hinge”. Unlike conventional shucking methods, the ingenious addition of the wooden block allows you to work with the knife pointing away from you, making your shucking experience a lot less intimidating, so you can dig in to your delicacy sooner. Stainless steel blade with tough, easy-to grip handle. Simply place oyster in groove and use the knife to pry it open. Oyster Knife - 15cm (l). Wooden Shucking Block – 11.5cm (l) x 4.5cm (h) x 7.5cm (w).